A leader’s most important job is to communicate. Every day, whether in a meeting or presentation, a water-cooler conversation or a formal speech, his or her ability to craft and deliver a clear message, one the audience will believe, is the tipping point between forgettable and transformational. To be truly effective, a leader’s words need to ring true and his or her delivery needs to be authentic. This handy, little guide helps readers achieve the meaningful, genuine presence that leads to lasting trust and quantifiable influence. Leaders project power through their presence. Leadership presence is the outward manifestation of leadership behavior. While leaders project their leadership, followers authorize it with their approval. Leadership presence is “earned authority.” Those two words are important. Earned means you have led by example. 12 Steps to Power Presencedemonstrates ways managers can improve their presence strategically and tactically to develop the trust of their people so that they can accomplish their goals and the goals of the organization. 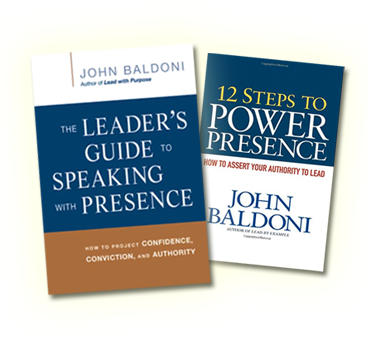 12 Steps to Power Presence explains what it takes to be a leader – one who can develop the trust of people in order to can accomplish individual and organizational goals and results.